Team Size: 6 teams of about 4 students each, all working on different projects. Instead of one-time service learning have the students identify (or identify for them) an organization that they can do work for throughout the semester. Worried about having them use organizational time? Have them go to already established volunteer events and do the rest of their service learning in the background. They can do things like make social media posts, write an op ed, do a literature review, search for grants, etc. At the end of the semester they can "offer" these things to the organization to do with what they want--or you can have all students work in the background with one organization and you can offer the very best of what your students collaboratively created. This is a lower division writing intensive class, so I teach public writing that gets posted on a public website. This website is live, and as more classes have contributed I get more choosy about the guidelines for which get posted online. The best articles from past semesters get used to teach content in the class as well as writing a couple times during the semester, which motivates students since they see a direct outcome of a good article. I also keep a website of any final project or class exercises that I can imagine students wanting to share with family, friends, or on social media. It is low stakes, and may not motivate all students. However, it will motivate some students and help them start conversations about the class content even after the course is over. Please use these materials as needed. Provide credit where appropriate. Annotated bibliographies of the literature cited in the study is available upon request. ​A lot of communication in the working world can often be conducted over email—from sending out schedules to communicating on team projects. Since a lot of communication can be asynchronous with emails, it can facilitate collaborating across time zones and allowing for more flexibility in the hours a person works. It also allows for quick communication and a record of what has been said, making it easy to go back to old emails and review their content. However, because it is challenging to transfer meaning with tone or body language via email, they must be well written in order to avoid giving a bad impression. Before you send your emails off you need to address them. There are three fields at the top of emails: To, CC, and BCC. So what do you choose and what does it mean when you receive an email and you are in the one of these CC or BCC fields? TO: The “To” field is simple, this is who the email is to. The email address of the person or people who you are sending the email to goes here. If you see your name here, the email is for you. If you receive an email and your name is in the “To” field you are expected to respond to it. CC: If you are a millennial or younger you probably don’t know what CC stands for. It stands for Carbon Copy. Have you ever filled out one of those forms that has three sheets of paper—white on top, then pink, then yellow? The ones where you write on the top sheet and press down hard so the text you write gets copied to the pink and yellow sheets behind it? The word Carbon Copy comes from this. Carbon is used to make the duplicate, so the sheets that get the text copied them are called carbon copies. If you CC someone on an email that means you are copying them on it but not addressing it to them. In other words, while the email is not to that person, you think they will want to read the email and be aware of the content in it. For example, you might be working on a team project and be in charge of emailing businesses to get price quotes. While you are the primary person managing that aspect of the project, others on your team may want to stay in the loop and see the price quotes as they come in. If you are CC’ed on an email, it means that while you are not the main recipient of the email, there might be information in the email that pertains to you. In some cases, you might be expected to respond to the email, in others you are not. You will have to read this email carefully to decide whether you should reply or not. BCC: BCC stands for Blind Carbon Copy. If someone’s name is in the BCC field it means that they receive the email, but no one else on the email other than the sender knows they have received it. This is used if you want someone to see an email that you have sent but not have the person in the To or CC fields to know you have included them. This field is primarily used in two scenarios. This first is when someone wants to keep it private that they are including someone in on the email. It is sort of like calling someone on speaker phone, but not telling the person you call someone else is in the room listening. BCC is not used often in this way but might be used, for example, at work in cases where an employee is having an issue with a co-worker and wants their supervisor to know, but doesn’t want their co-worker to be alerted that they have let the supervisor know about the issue. If you find yourself addressed in the BCC field on an email like this, it means that no one knows you received the email, so use decorum and don’t mention that you saw the email. The BCC field used in this manner can cause drama in the workplace so beware! The second scenario for using BCC is for mass emails. If an email is sent to a very large group of people the BCC field should be used for two reasons. First, it protects the identity and email address of everyone else on the email list. Second, it avoids people getting overwhelmed with emails. Sometimes, when people reply to mass emails, they accidently select to “reply all” instead of “reply” to the email, and everyone on the list will be bothered with the response if their addresses are not in the BCC field. (More on this in the next section!). When you reply to emails you are given the choice of Reply, Reply All, or Forward. Here is a brief overview of what each choice means. Reply: This is the typical default setting for most emails. Any time you hit Reply to an email it is sent back to any person listed in the To field, but it will notbe sent to anyone in the CC or BCC field. Reply All: This should be used for emails with multiple people included on the email in the CC field, when you want all original recipients to also receive your reply. If there are multiple respondents on an email but you only want the original sender to receive your email just hit “Reply” and it will only go to people in the To field. This is most useful when someone sends out a mass email but only the original sender needs to know your response. The person in the BCC field is not included in any replies to the email, whether “Reply” or “Reply All” is selected. This means they will not receive any future emails in an email chain unless you add them to the BCC field again. Forward: It is sometimes the case that someone not included on an original email will benefit from reading it. If you want to send an email to someone not in the original email chain, you can choose to Forward it. Once you select forward, you are able to fill in the To, CC, and BCC fields as you wish. The Forward option is a good reminder that everything you say in an email can be passed along so always choose your words carefully! A salutation is the greeting at the start of an email. The salutation can be formal or informal, depending on who you are writing to. For someone you know well and work with often, a simple introduction like, “Hello” or “Hi” works well. When you are writing to supervisors, potential clients, or people who you do not yet know, something more formal is appropriate. The most common formal salutation is “Dear.” In situations where you are writing an email to a person whose name you do not know, “To whom it may concern” is an appropriate salutation. Please note, some supervisors choose not to use any salutation and just begin an email to someone they supervise with a person’s name. This is done to avoid signaling that a relationship is overly familiar (e.g. Hi!) at the same it seeks to avoid being too formal (e.g. Dear) with a person they know well. Don’t be offended if someone in a supervisory role chooses to do this and feel free to do this if you are writing someone you supervise, but reserve it for those situations—otherwise use a salutation. ​Just as important as opening an email in a professional way with a salutation is closing it professionally with a valediction. A valediction is your email goodbye. As with salutations, valedictions can be more or less formal, depending on how familiar you are with the recipient. The folks at Proofread My Essay put together this handy list of email valedictions and when to use them. ‘Regards,’ and ‘Kind regards,’ – Good, all-purpose valedictions for day-to-day use, although some consider them a little formal. ‘Best wishes,’ and ‘Best,’ – Slightly less formal than ‘Kind regards’, but still appropriate for business e-mails or contacting someone you already know a little. ‘Thanks,’ and ‘Warm thanks,’ – Appropriate if someone has done something for you. ‘Yours respectfully,’ – Useful for contacting someone in a position of authority. ‘Your sincerely,’ and ‘Yours truly,’ – Formal valedictions traditionally used in letters, but now considered a little old-fashioned. ‘Yours faithfully,’ – Used when you don’t know the name of the recipient. You will always want to use salutations and valedictions in an initial email. Nothing bothers me more than an email from a student in which I get no salutation. It makes me feel as if the person does not know my name and can’t be bothered to look it up. (More on what to call people next). Whether or not that is the intention that is the impression it gives, so always include them in an initial email. Sometimes, however, emails turn into long conversation chains. If an email goes back and forth more than twice is it acceptable to become more casual and write back without salutations and valedictions. But if you aren’t sure, include them. If you are familiar with someone you can call them by their first name, otherwise, use their formal title. For women this is Ms. (never Mrs. or Miss), for men this is Mr. If you are not sure the person’s gender identity, or they prefer not to ascribe to one, you can type their whole name. If the person has a professional title, such as Dr. or Professor or Judge, use it. Deciding what to call a person is particularly easy if the person has already sent you an email. Look at how they signed that email and call them that. Many students will write me and call me “Carol” even though I introduce myself in class as Professor Glasser and always sign my emails to students as “Dr. 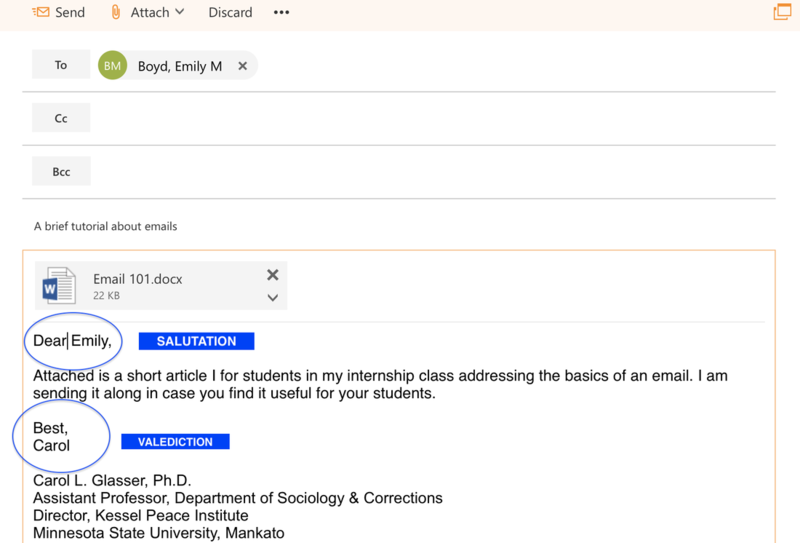 G.” Simply calling me Dr. G as I have chosen to sign my emails, shows that a student is paying attention and respects me (even if they don’t remember my name from the first day of class when I introduced myself as Professor Glasser). There are a of couple annoying things that happen with attachments. First, is the ghost attachment. This is when there is an attachment is forwarded from a scanner with nothing else in the email. Some scanners will ask you to input an email address and will directly send the scan to that email. Some people feel like it is easier to just send directly to the recipient. It might seem like no big deal, but it is. First, it will come from an unknown email address so it could be confusing.Instead of forwarding documents from a scanner without any note, download them, and then attach them all in a single email with text explaining what is in the attachment. Doing this sort of thing does not necessarily get noticed, but not doing it will. Attached are the spreadsheets we discussed in our meeting earlier today. This short article has provided a brief introduction to the basics of email anatomy. This is just a brief introduction to emails and there are many other things to consider, like having a professional email address, using good syntax and grammar, setting your email up so your name shows on the emails “From” field, having a good signature, and more. Most importantly, just remember that emails are like a letter. Write them well and treat them seriously because they make an impression.